Recently, Brazil has been in the international spotlight with the focus on the likely election of Jair Bolsonaro, with the final voting taking place on October 28th. As SmartCash strives for daily usage in all countries, understanding the political and regulatory environment of each country is paramount for success. On one hand, there is a socialist country that has created a State sponsored cryptocurrency and taken action against independent miners and exchanges. On the other, there are active cryptocurrency exchanges, integrations with the Casas Lotéricas of Caixa, and independent entrepreneurs offering new services, such as HugPay and Kamoney. Discriminatory banking services for cryptocurrency companies are also being challenged in the courts. The political turning point of Bolsonaro adopting crypto-friendly policies can transform the 8th largest economy in the world into a hub for cryptocurrency adoption and innovation and continue to attract additional investment into fintech. How does the SmartCash SmartHive approach take into account the different risk profiles of the regulatory and political landscape? SmartCash accomplishes this through a decentralized and incentivized approach to grassroots involvement. In regions such as Venezuela or anywhere there is high political risk, such as India, independent communities can still be supported through the SmartHive Project Treasury. These can encourage local communities that can build peer to peer networks which rely on services such as local peer to peer exchanges, rather than centralized ones. While there are still risks and a slower pace of adoption, there is a method to support even the most challenging situations. 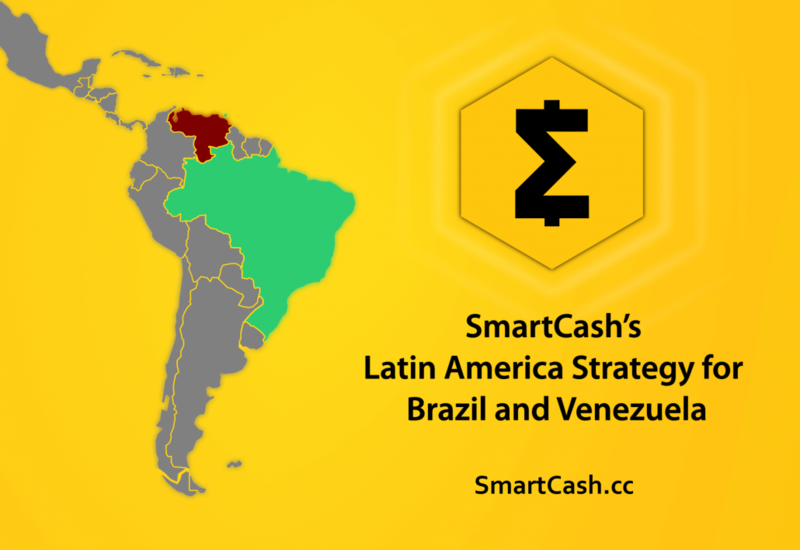 Compared to other cryptocurrencies, like Dash which has a focus on Venzuela, SmartCash has focused on providing real solutions to merchant adoption with regards to volatility and liquidity in larger markets such as Brazil. The efforts of Dash in the region have focused narrowly on merchant adoption, however many merchants have ended support after falling cryptocurrency prices or never actually signed up. Merchants who did sign up had to manage the risk of price volatility manually, and with falling prices outpacing even the high fiat inflation rates this was more important than ever. Without a solution to manage volatility, adoption of cryptocurrencies like Dash met roadblocks on multiple fronts to provide a realistic business solution. In comparison to Dash’s entrenchment in Venzuela, SmartCash’s merchant adoption in Brazil has been successful because instant exchanges to fiat with the use of the SmartBand remove any volatility risks a merchant would have on accepting transactions. SmartCash SmartHive also is able to increase the pace of adoption in welcoming countries such as Brazil through the independently run Hive Teams. In the case of Brazil, there is a strong network of partnerships that has enabled SmartCash to already be accepted at 85% of merchants in the country. These are partnerships such as Stratum CoinBr and Atar SmartBand, Kamoney, and HugPay that have rapidly put SmartCash as a top cryptocurrency in the region in a sustainable method. SmartCash shared the success and strategies for Latin America at the “Meeting of the Americas” conference on October 18th. You can read more about the success of SmartCash cryptocurrency payments in Brazil here. The SmartCash team has strong connections to Brazil, with two hive coordinators and seven developers originally from the country. There is also a dedicated Outreach team to Portuguese speaking countries with a social media presence on Twitter, Facebook, Gab, Minds, and Telegram. To learn more about SmartCash and the SmartHive approach, visit the websites at https://smartcash.cc/hive-teams/ and https://vote.smartcash.cc/. “Tracking Blockchain Technology and Regulation around the World.” BitLegal. “Regulation of Cryptocurrencies in Selected Jurisdictions.” Law Library of Congress.